The curtain is about to rise at Tyneside's newest theatre, following a £9.5m refit. 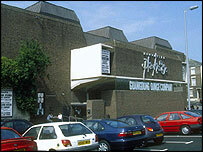 Northern Stage is on the site of the old Playhouse Theatre, next to Newcastle University. Work to create a new auditorium with three stages, two of which can be linked, has taken two years. The official opening takes place at the weekend, and the first performance will be the Dennis Potter production, "Son of Man". In the foyer of the theatre a new bar area will offer drinks and meals to theatre-goers and outside visitors. Richard Bliss, from Northern Stage, said he hoped good coffee and comfortable spaces would encourage people who would not normally visit the theatre to do so. The company will be staging performances which complement those on offer at Newcastle's Theatre Royal. Mr Bliss said: "We will be making our own work, and bringing in work that wouldn't be seen in other parts of the region. "When we were operating as Newcastle Playhouse we had people travelling from as far afield as Edinburgh or Leeds. The kind of work we will put on is something that is unique in the north. "With three stages there are plenty of things for people to see."